Today's American families are more complex and diverse than ever before.and today's child and family professionals must be fully prepared to meet their needs. Interventionists educators, health care professionals, therapists, and social workers will get the strong foundation they need with the NEW edition of this trusted textbook, a comprehensive guide to working effectively and respectfully with contemporary families. Highly respected experts Marci Hanson and Eleanor Lynch have expanded and updated their bestselling text, weaving in cutting-edge research on social, demographic, and economic changes and connecting the research to best practices in family-centered care. 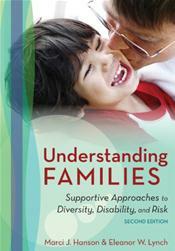 With a strong emphasis on family resilience, this book gets preservice and in-service professionals ready to: work with a broad range of families with diverse structures, backgrounds, and circumstances; advance strong parent.child attachment and interactions; match services and supports with each family's desired goals and outcomes; support families of children with disabilities; and address risk factors such as poverty, addiction, and violence. With this cornerstone textbook, the new generation of child and family professionals will have the research and practical guidance they need to improve the lives and outcomes of 21st-century families. Timely NEW information on demographic changes in the past decade; cultural and linguistic diversity; economic issues caused by the recession; the needs of infants and very young children; and infant mental health.